If you are planning a vegetable garden, one of the most important things you can do is consider how to keep unwanted pests out while protecting the food that you are growing. Many pesticides are dangerous for animals and people if they are ingested. It is important to always carefully wash any vegetables that you grow before you eat them, but if you are gardening with children, it may be difficult to stop them from sneaking snacks along the way. Taking extra care to avoid using harsh pesticides can add an extra layer of protection for your family. What Does National Organic Program Compliant Mean? The National Organic Program (NOP) has set forth certain standards that list what types of treatments are considered organic. In the case of organic pest control, it means that the pesticide treatments are derived from plants that are naturally repellent to bugs. There are strict guidelines for the products to be able to have that label applied to them. It is important to realize that if not used properly, that these pesticides can still be dangerous for you and your family members. They need to be stored and applied properly. Children should not be outside when you are applying them to your garden, and you should allow them to dry completely. Be sure to read the instructions to determine if they should be used directly on your vegetables or other plants or if they should be applied to the areas around your garden. To increase the safety for your family, you may want to have a professional apply the treatment for you. There are many different products available on the market. They are labeled NOP compliant. There are many guidelines that you must follow to be considered truly organic. If you are growing food just for yourself, then you do not need to worry about becoming organic certified. Instead you should just focus on choosing products that meet the guidelines and that are safe to use on or around food. Homegrown vegetables will always have an advantage over the ones you buy at the store because you know what you have down to grow them. You know which fertilizers you used, which pest control products you used and the types of seed you have used. 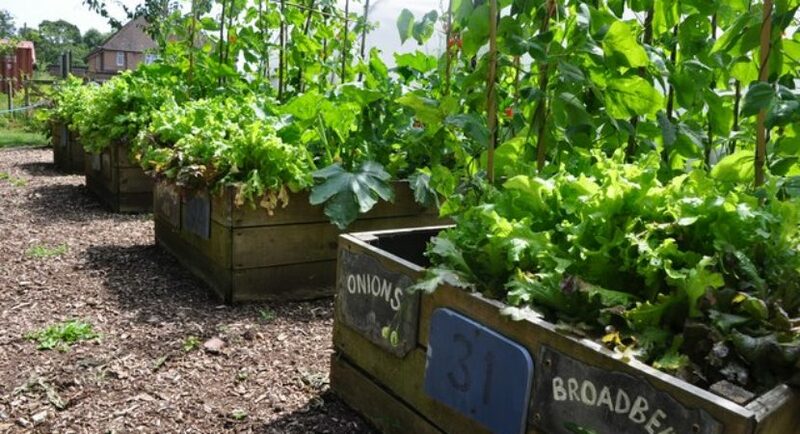 If you want to branch out and begin selling the things that you grow in your garden and label them as organic, you will need to take classes in order to understand the guidelines to help your produce become organic certified. Part of this process is choosing seeds that are considered organic, as well as the correct types of fertilizer and pest control. If you are considering this option, you may want to visit other growers in your area to learn about the options and process before you take it on because it can be quite extensive. Are There Natural Ways to Prevent Bad Insects from Invading my Garden? There are things that you can do to create natural barriers that will keep the harmful insects out of your garden. One of the options is create a border of plants that naturally repel harmful insects. Marigolds are one type of flower that you can plant around the borders of the garden to do this. Basil, chives and garlic are other plants that will work to keep pests out. Lavender, lemon thyme and lemongrass are other options that will create that barrier that you are looking for. How Can I Protect the Good Insects While Keeping Pests Out of My Garden? If you are a gardener, you understand the importance of bees and other natural pollinators. While it can be frustrating to find caterpillars or other leaf munching insects in your garden, killing all the bees can lead to serious food problems. There are steps you can take to protect the bees and other helpful insects. Be sure never to apply pesticides directly to flowering plants. Most pesticides will still affect bees. You can create a barrier around the yard or the outside of the garden to help prevent the other insects from finding their way inside. Try to use pesticides that are nontoxic to bees. Things like garlic, kaolin clay and gibberellic acid are not toxic, whereas pyrethrin, spinosad and diatomaceous earth are harmful to bees. Introduce garden friendly insects into your garden. Ladybugs and praying mantises will eat the other insects that will eat your garden. You can attract these bugs by planting basil, dill and cilantro throughout your garden. Consider setting traps around your plants that will natural attract the insects or keep them out. You can set out bowls of soapy water in your yard. Beer is another thing that will naturally attract the insects. Pick the insects off your plants manually. This can be a time-consuming process if your garden is large, but if you are spending time weeding regularly, you can pick off the insects when you seed them. This is a daunting effort and will not be one hundred percent effective, but it should still be helpful. Cover your garden. There are different products that you can hang above your plants and can help certain pests from landing on your plants. This might be more feasible if you have a larger garden. Be sure to pick produce as it becomes ripe since it will naturally attract certain pests to your garden and once they have fed on that produce they will move onto other plants in your garden. While organic pest control is beneficial, it is still essential that you thoroughly wash any vegetables that are in your garden. In addition, you should keep an eye out for pests that may harm you or your family members. Although gardening when it is cooler like at dawn and dusk may be easier, this is a prime time for mosquitoes. If you decide to go out at this time, be sure to wear your repellent. This can allow you to enjoy gardening without working about contracting a mosquito-borne illness. Miriam Caldwell graduated from Brigham Young University with a degree in English. She has been working as a freelance writer since 2005 and has written on a wide variety of topics ranging from personal finances, home care, parenting, gardening and pest control. She also teaches writing and enjoys helping others learn something new.